The suppression of post-stall separation over an unconventional 2-D airfoil at moderate Reynolds numbers (up to 106) using synthetic (zero net mass flux) jet actuators is discussed. 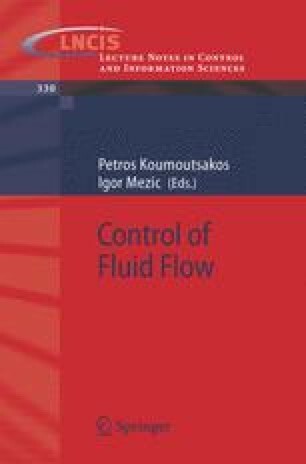 As shown by the authors in earlier investigations, the apparent modification of the surface shape by the interaction domain between the actuator jets and the cross flow results in a local displacement of the cross flow streamlines. The concomitant modification of the streamwise pressure gradient upstream of where the flow nominally separates in the baseline configuration can lead to complete suppression of separation over a significant range of angles of attack in the post-stall domain. While in the absence of flow control the airfoil is stalled at angles of attack exceeding 5°, actuation leads to either completely or partially attached flow within the entire range of angles tested (up to 25°) that is accompanied by a dramatic increase in lift and a corresponding decrease in pressure drag. Actuation is typically effected at frequencies that are an order of magnitude higher than the characteristic (shedding) frequency of the airfoil [i.e., F+ ∼ O(10) rather than F+ ∼ O(1)]. When the actuation frequency F+ is O(1), the reattachment is characterized by a Coanda-like tilting of the separated shear layer and the formation of large vortical structures at the driving frequency that persist beyond the trailing edge of the airfoil and lead to unsteady attachment and consequently to a time-periodic variation in vorticity flux and in circulation. In contrast, the suppression of separation at high actuation frequencies [i.e., F+=O(10)] is marked by the absence of organized vortical structures along the flow surface. The dynamics of the transient lift in controlled reattachment and separation are investigated using pulsed amplitude modulation of the actuation input and is exploited to improve the efficacy of the jet actuators by using pulse modulation of the excitation input.